PAMACC News: Can Africa’s regional flagship programme change its development narrative? Can Africa’s regional flagship programme change its development narrative? PARIS, France (PAMACC Africa) - ‘If we want Africa to achieve land degradation neutrality by 2030, if Africa must transform its agriculture and drive its development priorities to acceptable levels, then we have to take the regional flagship programmes outlined by NEPAD and partners very serious » cautioned Estherine Fotabong, Director of Programmes NEPAD Agency, as she opens the curtains for a panel discussion on Africa’s Green Growth Strategies at a side evet at COP21 December 5, 2015. The programme she said, underlined the political commitment for the promotion of sustainable development in the continent at large and regions in particular. She called on governments and development partners to further strengthen and consolidate their efforts to integrate the African regional flagship programme as mapped out by the Ministerial Conference on the Environment (AMCEN). Estherine Fotabong pointed out that the story about an action plan against climate change in Africa by NEPAD and AMCEN started since 2003 where a framework to deal with environmental management in the continent was reached. “We have since then put in place five sub-regional action plans today termed flagship programmes that will help bring some dynamism and create an enabling environment to fight climate change at regional and national levels,” Fotabong said. All five regions, the North, West, Central, South and East Africa are benefiting from the flagship programme, which is the first ever continental framework on environment that also gives room for collaboration between regions. The focused areas on the action plan include Green Economy Partnership, land degradation, desertification, biodiversity and ecosystem, African sustainability energy development programme and integrating environment assessment in sustainable planning. The steering committee to oversee the implementation of these programmes has equally been created with UNEP,NEPAD,AU UNECA,AfDB,AMCEN working together. One of the key flagship programme that will move Africa forward participants agree is renewable energy. ‘’Many of the flagship programmes cut across and so their plan of action have to be shared and documented so that the different partners know what is happening where and when. 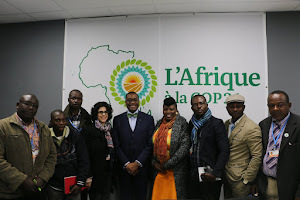 But we know that key among these plan is the renewable energy project that will help move the rest along,” AlyAbouSabaa, vice president of AfDB pointed out. He said it is against the backdrop that the African Development Bank announced the tripling of its climate finance over the next five years to 5 billion dollars. The financing he reiterated will be spread across the five flagship operations with emphasis on sustainable management. “While the AfDB continue to negotiate very hard for additional financing, we are emphasizing on the sustainable management of what we already have,’’ Sabaa said. The need to explore private sector financing was also reiterated. ‘The private sector cannot be left out in this drive and that is why they constitute a significant partner in the programme” noted Dr. Mohamed Abdel, advisor to the minister of environment in Egypt. The participants at the discussion expressed the need for ministerial departments involved with the implementation of the programmes at country level to work in tandem with their ministries of finance. “Planning and implementation of the flagship programmes at country level has to involve the ministry of finance of ever country so that the project get properly integrated in the budgetary allocation of each country,” The AfDB vice president said. But the African Group of negotiators and civil society organization has cautioned theMinisterial Conference on the Environment (AMCEN) on the need to ensure transparency in decisions reached at in all negotiations. A press release by African Group of negotiators and the Pan African Climate Justice Alliance, PACJA, of 6th December pointed on the need to ensure transparency in financial support to African countries. “There is need to double Green Climate Fund in the immediate term and treble it by 2020,” the release stated.